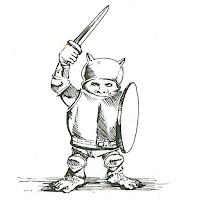 The third and final battle of the Terror of the Lichemaster is "The Defence of Frugelhofen". The previous scenarios ("the Assault on Gimbrin's Mine" and "the Attack on the Bogels Farm") were just preambles determining the conditions under which this last struggle will be fought. Will the villagers get warning of the coming onslaught? Will there be enough refugees to bolster the ranks of untrained townsfolk? Or will the Lichemaster's legion be swollen with fresh members of the walking dead? The Defence of Frugelhofen conjures The Seven Samuria (1954) or The Magnificent Seven (1960): A handful of heroes must lead a rabble of villagers in a makeshift defence of their homes. The village of Frugelhofen contains five such champions: Albi Schutz, Grimwald Calaco, Gim Gundel, Antonio Epstein and Riolta Snow. If Gimbrin Finehelm and Hunk Bogel also escaped, there will be seven brave heroes in all. What's the battle going to look like? The village can muster 40 fighting men, 20 of whom have bows. The heroes also have the benefit of several magic items from Albi's store like an Adamantine shield and sword. If the Bogels or Dwarves survived to bring warning, the defenders may dispose their forces anywhere on the table. If not, the defenders are confined to the streets of the village. Worse, the magic weapons are undistributed and are sitting inside a chest in Albi's store. 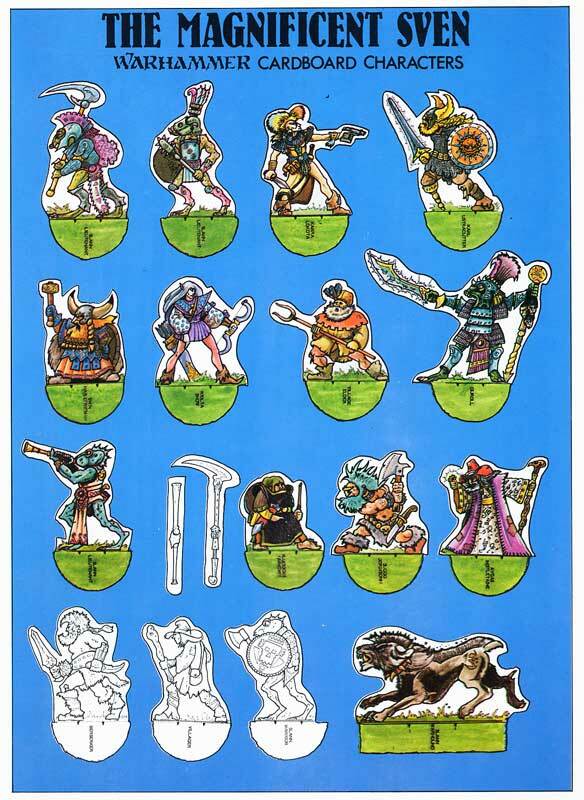 The Lichemaster has 20 skeletons and 10 zombies led by Lord Krell, plus any remnants from the strike-forces of Ranlac and Mikeal Jacsen. More importantly, he himself is a powerful necromancer who is able to regenerate magic points whenever a villager is killed. Plus the Lichemaster has the advantage of attacking from a number of angles, and if the villagers are caught unaware, the undead can steal a march on the first turn. First we have Albi Schutz. We're told that he is the "former inter-valley wrestling champion" and that "Being a popular hero never sat easily upon his shoulders: for one thing he could never overcome a basic urge to throw people to the ground and twist their legs together." And so he retired to Frugelhofen "in an attempt to get away from drunks, fight enthusiasts and people who wanted to give him things." 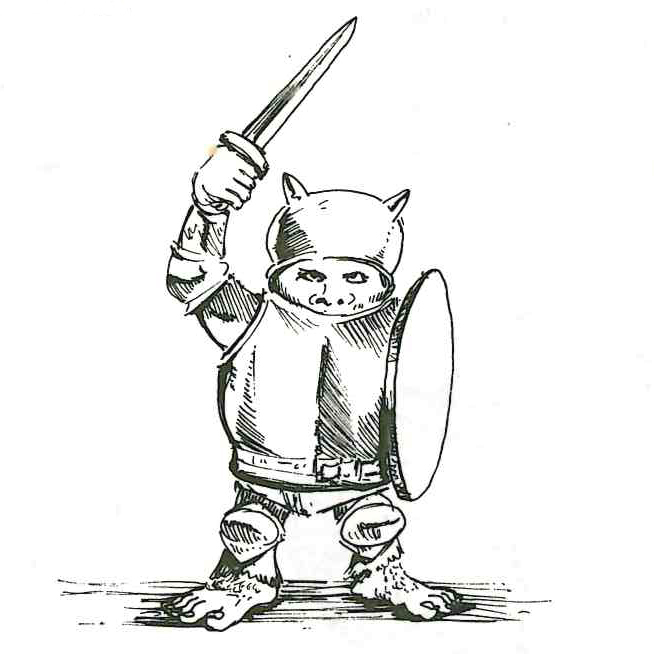 In the game, Albi is a Major Hero in full armour. His miniature is The "Knight" from Citadel's C01 Fighters range sculpted by Jes Goodwin in 1986. 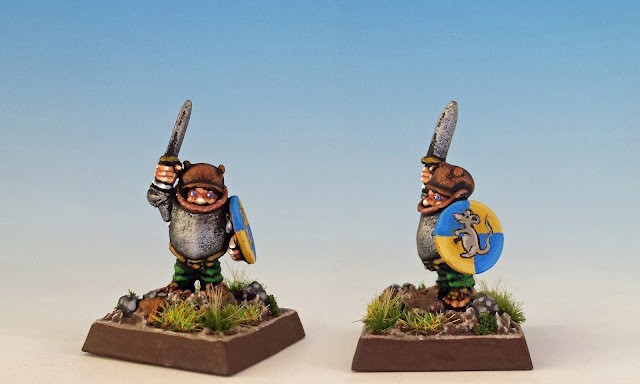 Gim Grundel the halfling is our third hero. All we know about him is that he's a runaway from the Empire, and that he appears to be wearing a chamber pot on his head. I tried to lend him a little dignity by painting his shield with the insignia of the mouse that roared. He is one of the C11 Halflings sculpted in 1984 by the Perry Brothers. Fourth is Antonio Epstein. The campaign book tells us that he "is travelling through Frugelhofen on his way to an exotic party in the land of Italia to the south (where he hopes to meet and force himself on a wealthy heiress). However, he has delayed his journey due to the mesmerizing presence of Riolta Snow - a young elf adventuress." 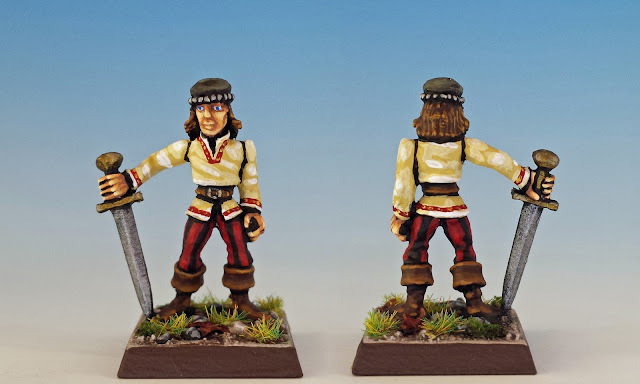 Graeme Davis left a comment on one of my posts about Jewish miniatures where he said that Antonio Epstein is probably based on Tony "Ep" Epworth, who worked at Citadel in the early days. Sounds like Ep had a bit of a reputation viz. the ladies. In the game, Antonio is an unarmoured Champion. He is so befuddled by Riolta's beauty (and wealth) that he must stay within 4" of her at all times. 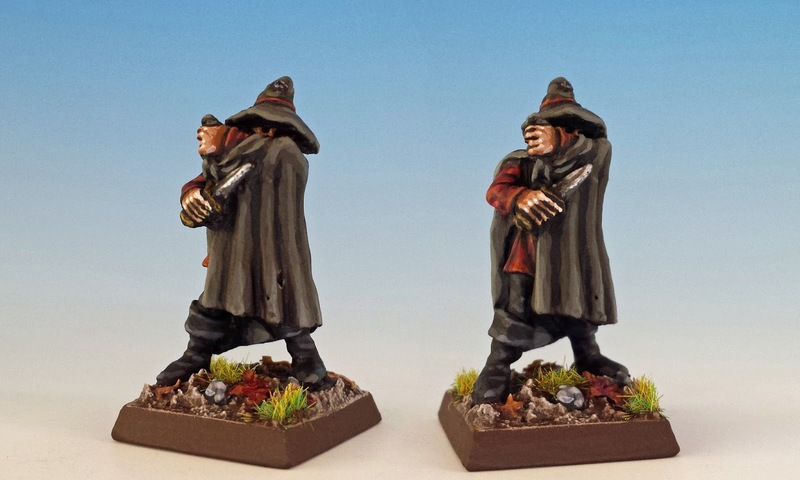 Before Terror of the Lichemaster came out, his miniature was originally called "Ali" and belonged to Citadel's C01 Fighters range sculpted by Jes Goodwin in 1986. (The name Ali makes me wonder whether this sculpture was originally based on another Citadel employee, Aly Morrison. 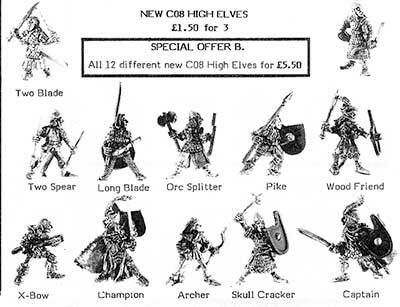 After all, the other miniatures in this range have names like "Celric Doomwarder"... Ali sort of sticks out). And finally there's Riolta Snow, the aloof object of Antonio's affections. She's described as "an amazingly successful and talented archeress" making a grand tour of the Old World (which is how she gets caught in Frugelhofen during the Lichemaster's attack). She also constantly antagonizes the natives, referring to their manners as gauche and calling everyone cutey. Well whatever... as a High Elven Major Hero, she is by far the best fighter in Frugelhofen. 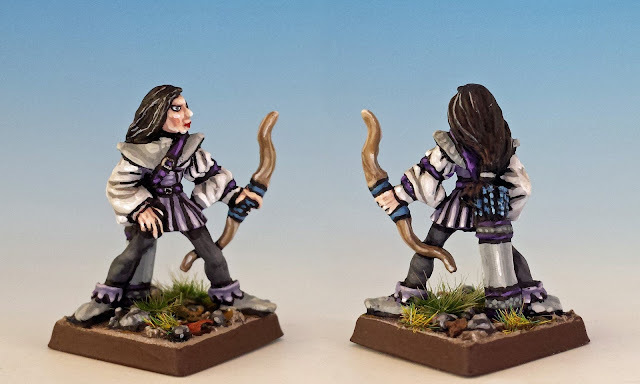 Her miniature is the "Archer" from the range of C08 High Elves, sculpted in 1984 by Aly Morrison. In my next post, I'll look that the village militia defending Frugelhofen... thanks for stopping by! Great! Magic of classic minis :) your painting also masterpiece! Your painting is so good that I'm flattered that you enjoy mine. I love those maps. That's Dave Andrews' work. 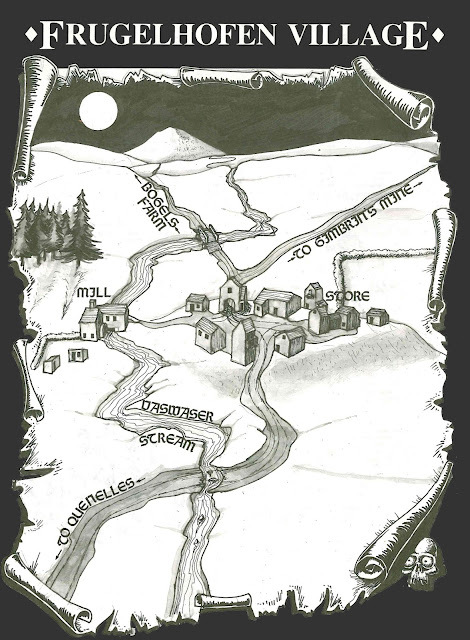 In my view, no fantasy world is complete without maps! 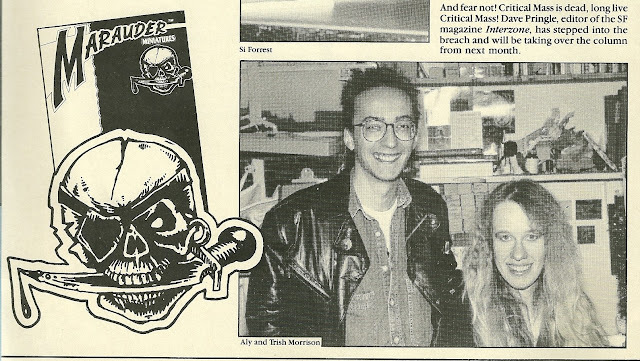 Someday I'm going to try to put together a comic book like the ones that you do. But first I need to actually play the Lichemaster scenario! Wonderful work. 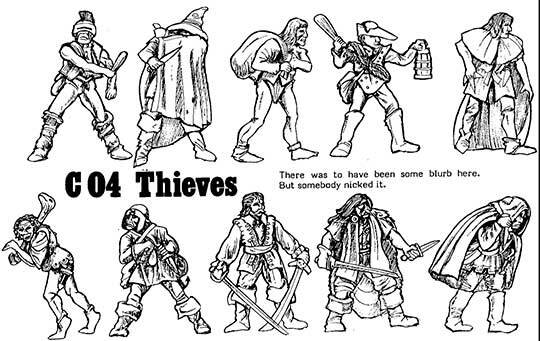 Looks like you picked out some great figures to represent the townsfolk, too! Can't wait to get a look at those! Good eye, Mr. Mouse! 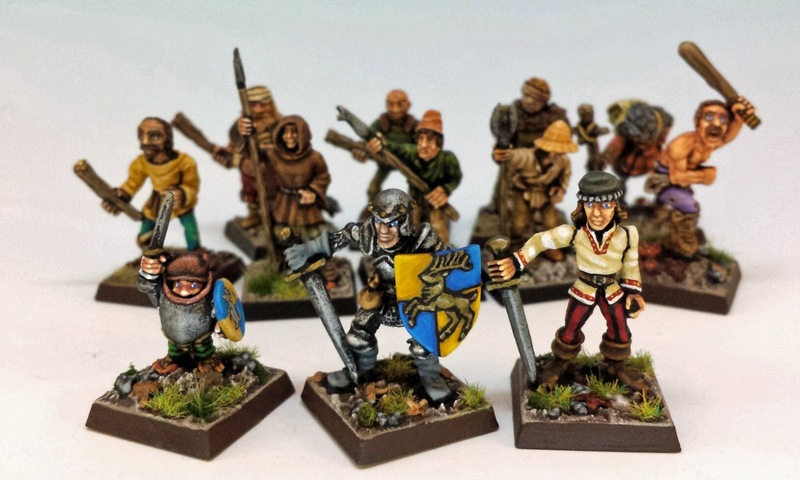 Those townsfolk are some of my favourite minis. Stay tuned... I'll post about them in a couple days. So... How about you make it down to Oldhammer day USA next year and run these scenarios? 😁 Your stuff looks amazing! That is a grand idea, Andrew. ROAD TRIP! Thanks Barks. 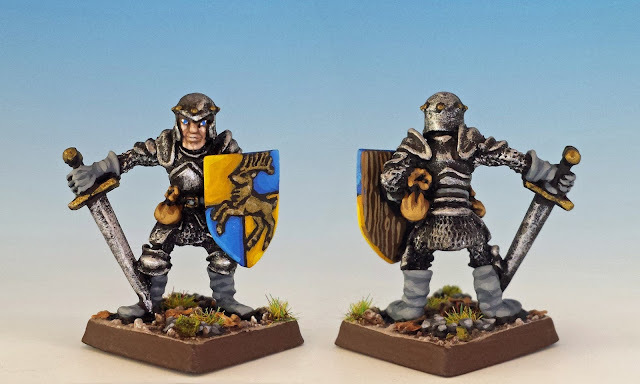 I was afraid at first that I didn't have the chops to properly paint the mouse on the shield. I'm no great shakes at free hand. But I'm happy with the way he turned out. Sometimes the painting gods smile on us! Just catching up on the Terror of the Lichemaster series. Excellent work. Great painting, nice history... but I do wonder why you didn't paint Riolta Snow in her traditional colour scheme? Your sharp eye has disclosed one of my weak spots. I've never been quite happy with what I did with Riolta. I wanted to try painting her with a palate of "snow" -- whites, light grays. To give the long story (and I guess I always give the long story), I was thinking about the description from the Mabinogion: "I was looking upon the snow, and upon the raven, and upon the drops of the blood of the bird that the hawk had killed upon the snow. And I bethought me that her whiteness was like that of the snow, and that the blackness of her hair and her eyebrows like that of the raven, and that the two red spots upon her cheeks were like the two drops of blood." Sometimes we swing and miss! Antonio Epstein reminds me of a young Mick Jagger for some reason. I am very happy with your work on Riolta, and was quite lovesick for a whole day after first reading this post. Well that made my day. Thanks MP. Isn't it fun to imagine the days when the most feared terrorists were anarchists with bombs under their tweeds. "Riolta Snow has the distinction of being the only named character to appear in two of Games Workshop's scenario packs from the 1980's." GREAT blog by the way! Keep it up and going! Splendid observation, Eduardo - thanks for the correction! 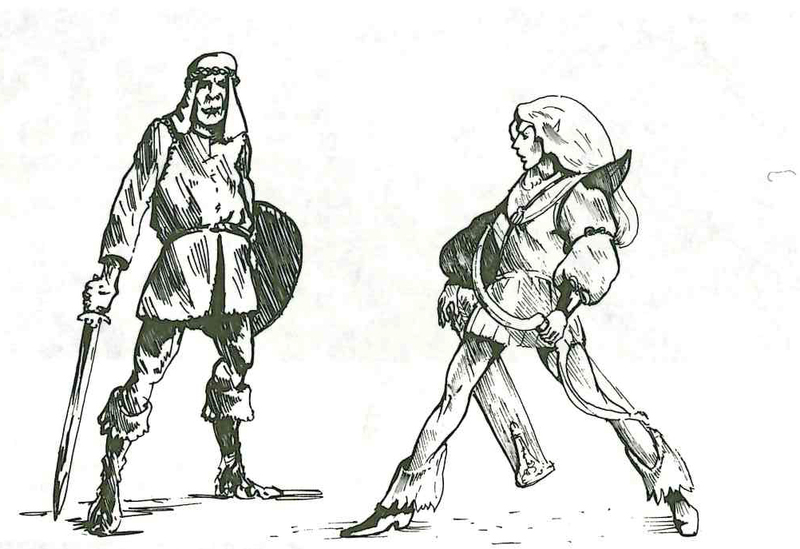 The concept could be spiced-up by using the WFRP to actually roleplay, then modify the skirmish setups of the 3 battles due what the players fucked-up, or succeeded with. Beyond that it is an old example of how a minimalist but competent approach can entertain for an evening. Sad retrospective, as few followed the example, and most commercial junk remains not worth purchasing. But, luckily, that is just my opinion.